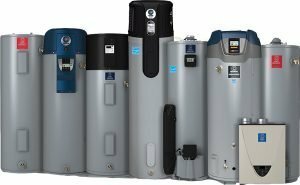 If you need a new water heater, Atlas Home Services offers the best value for turn-key water heater replacements in Northern Virginia. Our turn-key water heater replacement services include everything you need to get the hot water flowing again. We stock a large selection of water heaters and in many cases are able to remove and replace your unit the same day! Your Atlas Home Services bonded and insured plumbing professional is a highly experienced customer focused technician that is happy to answer any questions you may have. Every technician follows our strict customer quality guidelines including donning foot protection, removing and cleaning the work area leaving it better when they arrived. When replacing a water heater the homeowner is presented with a variety of confusing choices. Do I need an expansion tank? Do I need a water tank booster to increase capacity? Do I need a county permit? Your Atlas Home Services professional will help you make the right choice for your home and particular situation based on their years of experience. Prices include everything to get your hot water flowing again – no hidden fees! One call does it all! Want to save an extra $100 on your water heater? Click Here! 6 years parts and one-year labor warranty. Water Heaters in Stock and we are often able to offer same-day installation. *Prices based on standard installation. Call Atlas Home Services Today! Call us at 703-789-9070 to schedule an appointment, or complete our online inquiry form and we will promptly contact you to discuss your plumbing issue.